. . . or should I say, les poires de Julia. Poires au Gratin, to be exactement. 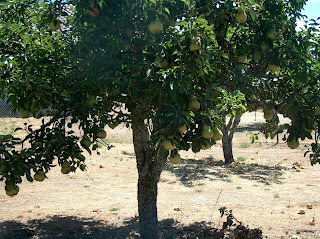 Like every food lover in America, I went to see the Julie/Julia movie last week. And like everyone else, I love love loved it. Amy Adams. Meryl Streep. Food galore. What's not to love? "I'd really like to make that boeuf bourguignon," said my mom after the movie. Ooooh, oooooh, a Julia dinner party! I could hardly contain myself. Mom set a date, invited a few friends along with her always hungry daughter, and to make a long story short, we had a splendid evening. 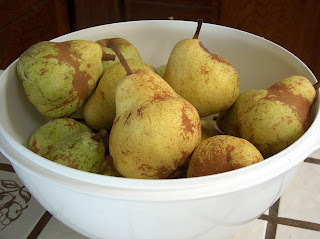 Authentic Julia recipes included a curly endive salad with a garlicky hot vinaigrette, the aforementioned boeuf, and my contribution, the Pears Baked with Macaroons, a dessert which could be served hot, warm, or cold. Bad blogger, I forgot to get pictures of the actual event. But I did get shots of the pear dish. So here, for all of you who are dying to make a dish that's very tasty, filled with butter, and way more time consuming than most dishes made here at the castle, are the steps involved in making Julia Child's Poires au Gratin. First you toast your macaroons. Julia doesn't mention this until step four, but they take an hour to toast. Trust me. You want to start them now. What, you have no macaroons sitting around, waiting to be toasted? 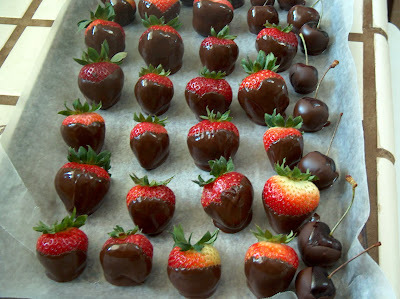 Run out to the grocery and buy a package of these. Shhhhh. Tell no one. Butter your casserole dish. Yikes, Julia, that's a lot of butter. Next you're going to prepare the fruit and wine sauce. You must force your jam through a sieve. Your jam will not like being forced through a sieve. Then you will mix it with a bit of dry white wine. Is Pinot Grigio a dry wine? I have no idea. But it is white. And we had some. Bingo. Make sure you have pg. 583 marked in your Mastering the Art of French Cooking book, along with pg. 630, because you will be flipping back and forth. Now you're finally ready for Julia's step two (of five steps). 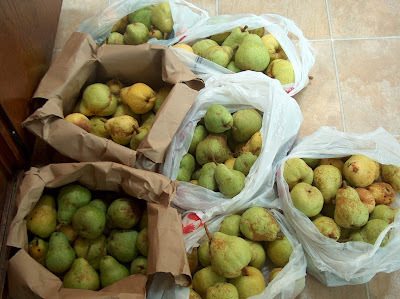 Peeling and slicing the pears. Step one, preheating the oven, will still be undone, as your macaroons are still toasting (step four-a). 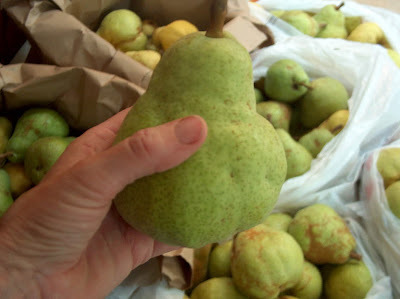 Your pears, now sliced, will be placed in your baking dish. Your sliced pears, in your baking dish, will now be covered with your jam sauce. Your sliced pears in your baking dish, covered with your jam sauce, are now topped with your toasted macaroons that have been pulverized in the blender (back to pg. 583). Your sliced pears, in your baking dish, covered with your jam sauce and topped with your toasted macaroons that have been pulverized in the blender (pg. 583), are now topped with butter. Lots and lots more butter. Then you bake it, and eat it, and have to admit that it really was awfully, awfully good. Would I make Julia's Poires au Gratin again? Not without cutting out much of the butter, toasting, pulverizing, and sieving. I'm just cranky that way. And now I'm curious. Have you tried any of Julia's recipes? What did you think? Would you make them again? 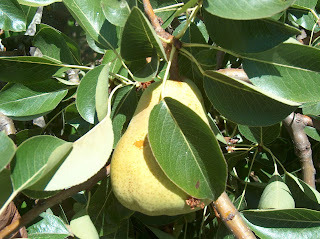 And if you have any pear recipes, please share. NOTE: Want more recipes? 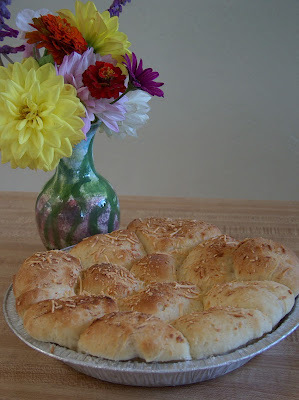 Check out Tempt My Tummy Tuesdays over at Blessed with Grace. I love food and I love books. Whenever I can find some overlap between the two, it's, for me, a little bit of heaven. I was excited a few months back to get to read an advance copy of a new book by author Susy Flory. 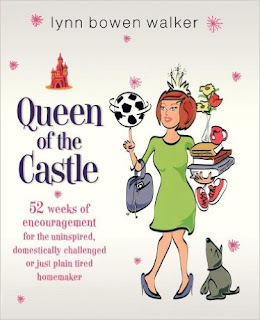 While her book is not about food -- it's about nine notable women who changed the world, and the changes they inspired in Susy -- I did take the opportunity to ask Susy if she had a recipe she could share with Queen of the Castle Recipes readers. The blackberry-peach coffee cake she's "been in love with lately" follows. But first, a few words about her book. 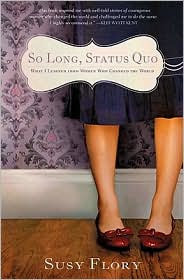 So Long, Status Quo: What I Learned from Women who Changed the World is a truly inspiring book. Susy Flory examined the lives of selfless, serving women like Harriet Tubman, Eleanor Roosevelt, and Mary Magdalene and actually applied the lessons she learned to her own life. How often do I read of someone's courageous, loving acts and think, "Oh that's nice," then move on with my day? Susy actually allowed these women's lives and actions to infiltrate her own. She found herself moved to sell her own jewelry to fund wells in Sudan; she worked side by side with local immigrant farm workers; she embarked on a secret humanitarian mission to Cuba. In short, she allowed what she read to change her. How I admire her for that. I hope you get the opportunity to read So Long, Status Quo. You will be moved. If you're on a tight budget with no extra $$ for book purchases, you can ask your public library or church library to consider buying it. Most librarians are happy to hear purchasing suggestions from their patrons. Beat butter at medium speed until creamy. Add sugar and brown sugar and beat well. Add flour, cinnamon, and nutmeg and beat until combined. Set aside. Beat butter at medium speed until creamy. Add sugar slowly, beating well. Add eggs one at a time, beating after each one. In separate bowl, combine flour, baking powder, and salt; add to butter mixture alternately with milk, beginning and ending with flour mixture. Beat at low speed until blended after each addition. Stir in vanilla. 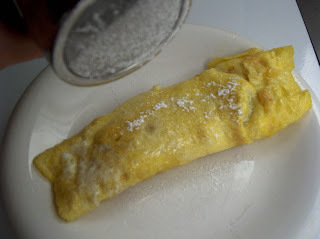 Pour batter into a greased and floured 9-inch springform pan. Top with peaches and blackberries. 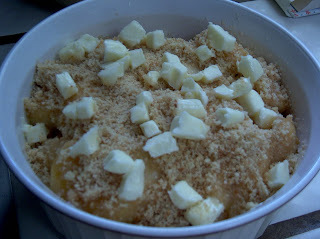 Sprinkle Streusel Topping over fruit. Bake at 350 degrees for 1 hour 10 minutes - 1 hour 20 minutes, until center of cake is set. Cool completely on a wire rack (about 1 1/2 hours). (Susy's note: we are not waiting this long, believe me!) Dust with powdered sugar. Garnish with fresh blackberries and peach slices, if desired. Note: Shiny or light colored pan gives best results. From Southern Living, June, 2009. NOTE: To find out more about Susy and her writing, visit her at http://www.susyflory.com/. A lovely way to start the day, if you ask me. Also a fine choice for those brown-bag lunches or an after- school snack. These travel well. The original recipe, which I'm pretty sure came from the back of the sugar bag, called for walnuts, but I never add them. Feel free, if you have nut lovers in your house. In large bowl, stir together sugars, flour, baking powder, and salt. In separate bowl, mix together milk, butter, eggs, and vanilla. Make a well in the center of dry ingredients and add milk mixture; stir to combine. Stir in chocolate chips (and nuts, if using). 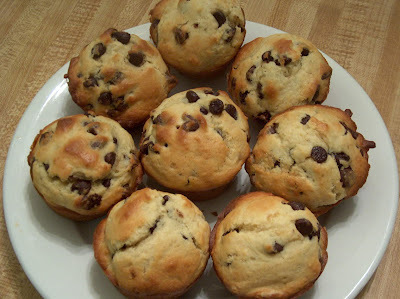 Spoon batter into greased muffin cups. (Make sure to grease the top of the muffin cups and on the edges around the cups, to make it easy to get them out when they're done.) Bake at 400 degrees for 15 - 20 minutes, until a toothpick stuck in the center comes out clean. Makes 12 large muffins. NOTE: Don't forget to enter the book giveaway here if you want a chance to win Susan R. Blaske Williams's book Making It Home: How to Run Your Household Like a Business . . . and Find Your Heart Along the Way . Contest is open until Friday, Aug. 28. Surprisingly tasty, like soy sauce-flavored crunchy squash. 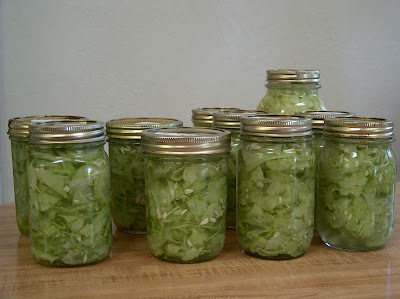 Try this if you've got some cucumbers hanging around and you're a little pickled out. Or if you're in a vegetable rut. I divided this recipe by three because I was fully expecting not to like this. I apologize, perky little magazine article. You were right; these are indeed tender-crisp and bursting with fresh, full flavor. Peel and halve each cucumber lengthwise. Cut into one-inch chunks. 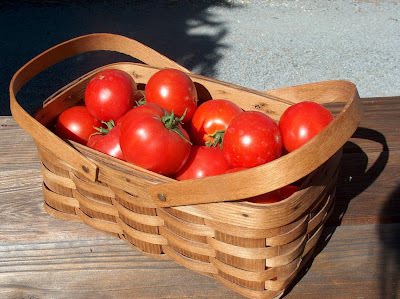 In 5-quart Dutch oven or 10-inch skillet over high heat, in very hot salad oil, cook cucumbers, stirring quickly and constantly until well coated with oil. Add rest of ingredients, cover and cook over medium heat for 5 minutes or until tender-crisp, stirring occasionally. You know how through the internet, you get a chance to connect with people with similar interests, people who you'd probably be best buddies with in real life but who live so far away you'd doubtless never even get to meet if it weren't for web sites and blogs? 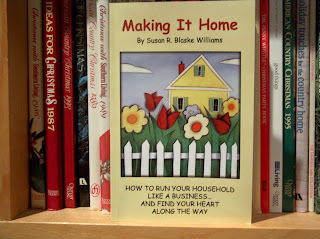 That's why I was so excited to discover the site of Susan R. Blaske Williams, a kindred spirit who lives way across the country from me and who publishes Making It Home Magazine: Encouragement for Women with a Heart for Home. A mom of four children and grandma of three, Susan loves to offer support to women in all their roles as moms, wives, homemakers, and grandmas. She's also written a book, a basic training manual for women who're turning their attention toward home. It's called Making It Home, and I'll be giving away a copy in my first book giveaway ever (yay!) later this week. So stay tuned. In the meantime, here is Susan's recipe for Zucchini-Key Lime Cobbler. It's not only a great use for those gobs of summer squash that may be overrunning your back yard, but also, says Susan, it tastes "better than apple pie." One year, we were blessed not only with a surplus of zucchini from our own garden, but sacks of even more from friends and neighbors who wanted to share their zucchini blessings. 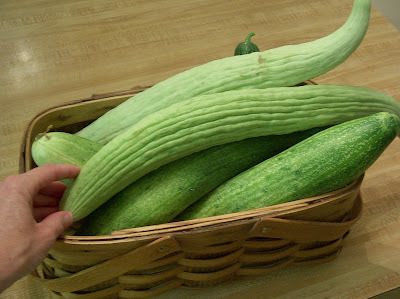 Within a matter of days, I found myself elbow-deep in piles of the happy green squash gathering on my kitchen island. It had indeed been a banner year for zucchini -- most of the specimens on the countertop were nearing the size of footballs. I needed to get to work. 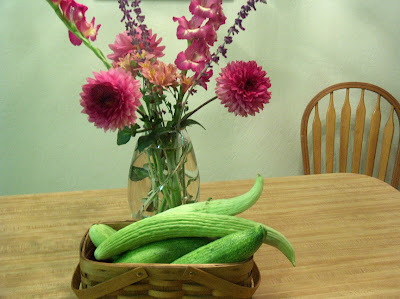 Each year, when the harvest was not as plentiful, I would take a dozen or so zucchini and make several squash casseroles and store them in the freezer to enjoy over the winter -- or make a few stir fry dishes using fresh zucchini. This particular year,we were in zucchini heaven, and it was time to get creative. What more could I do with all of this zucchini? Digging through some old cookbooks, I was surprised to come upon some zucchini dessert recipes. Zucchini for dessert? Hmmm. Let's give it a try. 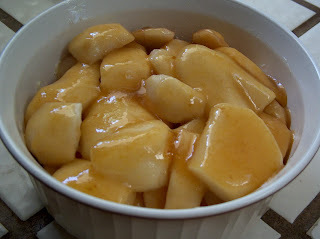 I chose a recipe which called for lemon juice, but since I did not have any available, I substituted key lime juice. The recipe I am including here has key lime juice listed in the ingredients, but you may also use lemon juice. The key lime juice gives it a bit of a tangier flavor, whereas the lemon juice version is a bit more subdued. The recipe uses quite a few zucchini -- which was a blessing since it helped to reduce the pile in one fell swoop. And, to our complete surprise and amazement, the zucchini dessert tasted better than apple pie! My guess is that the zucchini absorbs the flavor of the key lime or lemon juice, and it becomes tart much like a Granny Smith apple. Perfect for a pie-like dessert. 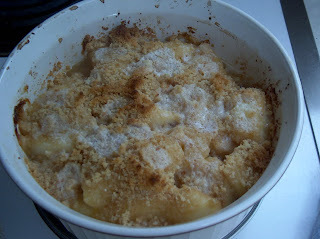 I renamed the dessert as cobbler because it didn't quite look like a pie -- or anything readily identifiable. A cobbler seemed to cover the description. You may call it whatever you like -- and you might want to leave "zucchini" out of the title just to surprise people when you tell them the actual ingredients. Few will ever guess -- it's that good! Place all filling ingredients in medium saucepan. Bring to boil then reduce heat to simmer; cook until zucchini are tender (about 10-15 minutes). Prepare crust ingredients by mixing flour, sugar, cinnamon, and salt in a large mixing bowl. Take the cold butter and cut it into the flour mixture. (Butter can be softened slightly by placing it in the microwave for 15-20 seconds.) Mixture should be crumbly. Take approx. 1-1/2 c. of the crust mixture and press it into the bottom of a greased 9- x 13-inch pan. Bake for 12 minutes. After bottom crust is done baking, pour filling mixture over it. Crumble remaining crust mixture over the top of the filling. Bake for 40 more minutes. Submitted by Susan R. Blaske Williams, editor/publisher of "Making It Home"Publications -- http://www.makingithomewebzine.com/. 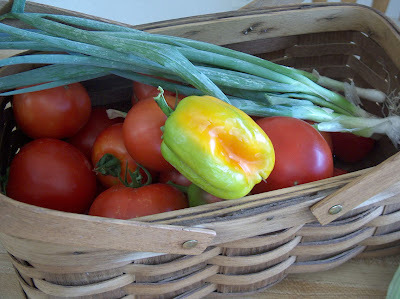 I feel a batch of Laurie's Roasted Tomato Soup coming on. First off, lest I give the wrong impression, I am not the gardener in the family. That would be Kahuna. I am merely the fortunate party who is married to a worker bee who loves to plant gardens and grow flowers and generally toil in the yard. Meanwhile, I get to read a lot. 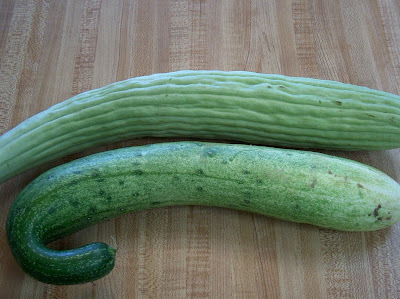 That said, I do spring into action when the Kahuna starts growing cucumbers the size of small clubs. There certainly are a lot of the little suckers. This is my hand, springing into action. When it's time to get to work, I know I can count on Lori at A Frugally Old-Fashioned Homemaker for tried and true recipes. Which is why I was so excited to find her recipe for freezer pickles. No need to pull out the big old canning vat. You just slice up an onion and some cucumbers (I used my food processor for that part). You salt them and let them sit in a bowl for two hours. You heat up some white vinegar and sugar until the sugar is dissolved and pour over the whole cucumber mixture. And there you have it. Jars of pickles to go into your freezer, ready to be pulled out any time you want to bask in that feeling of being industrious. There are three batches here. I am basking. Experimenting over here with basil vinegar. 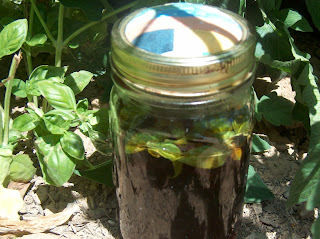 Put several sprigs in a jar and cover with warm malt vinegar. Wait a couple weeks and see how she turns out.